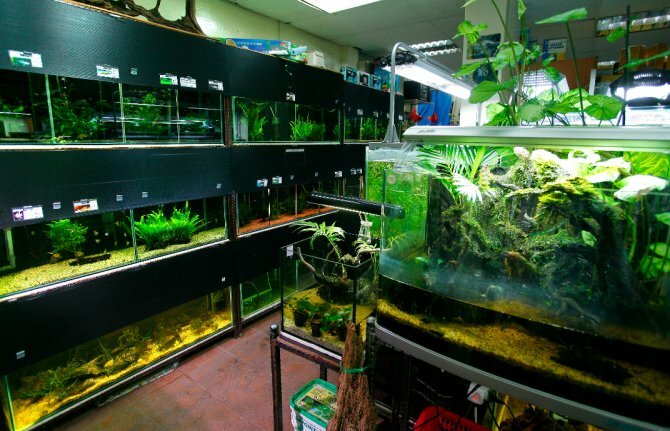 Where are aquatic retailers going wrong? Aquatic stores are all too often a myopic bunch. I get to see lots on my travels, part work part leisure, and on many, many occasions I see the same errors being made over and over. So here’s a breakdown of some of my biggest bugbears, and I can assure you that from what I’ve seen, if I ever get back into the retail game myself, I’ll be doing my damndest not to make any of these slips. Almost everyone I visit has not a clue what is going on right on their own doorstep. They imagine that theirs is the only store doing things right, without an inkling of what rivals two miles away are up to. Frequently I’ll go to a property where staff will excitedly show me a new fish, pointing it out as though it’s the next license to print money. Then I’ll go to my next stop, and they’ll have been sat on said fish for the last six months, and can’t sell more on the grounds that they’ve saturated the market. It pays to be clever about these things. I don’t want to see shops being predatory about it, spying on other local stores and preparing for a coup de grace. Bounce off of each other, I say. Talk to each other. The regions where I always see thriving stores with exciting stock are those areas where stores communicate, do their own thing, and generally don’t step on each other’s toes. Bigger doesn’t mean better. Just because a store is in a huge property doesn’t make it any good. In my five top stores in the UK, three are miniscule, and they batter their local rivals for selection and quality. Too many tanks can be a nightmare to keep maintained, and concentrating on quality livestock in fewer tanks gains kudos from savvy customers. Fish hobbyists don’t care about billions of fish, they’re only going to buy a few anyway. What they want are plump, healthy animals that have been cared for. There’s no bigger turn off to a customer, and this kind of goes hand in hand with size. To me, empty tanks indicate inept managers who can’t keep on top of stocking levels. Empties also scream ‘poor’ to customers who see an empty store as one that the vultures are circling. That might sound harsh, but that’s the feedback I get when I chinwag with customers outside shops. Contingency plans are vital. If an import is delayed or cancelled, then the store that has the sense to get a few fillers from a local wholesaler is the one that will win customers. Because like me, many shoppers will take one stroll about a shop with 20% empty tanks, and go straight back out. Kind of a no-brainer, but I want to see healthy stock. If stores get sick fish, as we all do from time to time, they shouldn’t be ashamed to put a notice on the tank explaining why they’re off sale. Ultimately, if they can’t explain to the customer why fish are being withheld, then we’ll imagine our own reasons, and you can be sure that half the time those reasons won’t be charitable. Seriously, this is 2012. Why on earth is anyone still allowing a dead fish to be visible in a shop? One dead fish, hidden away behind an ornament is excusable, but a dead fish out in the open will soon become the talk of the town. Yes, I’m aware that there are mortalities associated with imports and acclimation, which is why I consider the occasional one a possible oversight. But if it’s been dead and decomposing for a day or two, or if there are deads in tank after tank, then expect me to pull up the manager in store and demand an explanation. Here’s an easy experiment to try. Start talking in the pub about fish, you’ll soon get a good selection of people involved, the hobby’s that big. Keep an ear out for how quickly stores become identified as 'the one with dead fish everywhere'. Mud sticks, and that’s not the kind of stigmatising I’d want connected to my name. Get those deads out. There is, quite simply, no excuse for them. All you’re doing is giving ammunition to anti pet groups. They have video cameras nowadays. We all do, on our mobile phones. I like shops that play to their strengths. That doesn’t mean they have to dedicate the whole store to, say, Discus (although it can be nice when they do), but if there’s staff there that excel in them then I want to see rows of those fish offered, with someone I can chat to all day long about them. Make no mistake that I’ll always buy a fish from someone who can tell me about it over a store that might have more, but remain clueless about them. When all the stores have the same bland fish, from the same bland suppliers, then the only things marking anyone apart are price and convenience. If there’s a store slightly out of town, and there’s a bigger shop in the town centre with the same range, then I don’t think anyone should be surprised if people won’t go out of their way. The price of petrol has gone up, if nobody has noticed, and I think I speak for most of us when I say that we don’t want to burn £10 to look at the same racks of boring platies that we could have found just down the road. Fish selection needs to be exciting if people are going to travel. I’ve seen a few small stores rising up disproportionately above the trade this last 18 months, and all because they have excellent fish while everyone else is panicking and sticking to the same old, same old. Shops need good employees, that much is known, so why am I seeing so many rubbish ones about? Employees that grunt, condescend, and carry a posture that signals how much they hate their job don’t entice me into buying. I honestly cannot count the number of transactions that have been lost by shops this year because of the attitudes of employees. I, like most people, will happily take my custom elsewhere in the face of incompetence or arrogance. Personally, the single most successful store I’ve seen skyrocketing in recent times (and maybe even ever) has been the result of some superb Internet handling. I don’t care if you have an amazing website, although if you have one it’s vital that you keep up to date with things like stock availability and offers. Retailers often grizzle about online competition. Well, here’s some bad news. It’s never going away. Ever. It’s here to stay, because it’s what a lot of customers want. We’re still very much voting with our wallets. Don’t get me wrong, I love brick and mortar shops, and the trade would be dead without them. But I also love being able to track down fish and goods that I can’t find within a fifty-mile radius of my house. The stores that I’m reluctant to ever visit are the ones where their last website update was in 2009. That’s even assuming they’re even online on the first place. Like most savvy buyers today, the first place I’ll look for a place to shop is the Internet. I’m not suggesting that stores swap their mortal souls for a digital one. But at least embrace the online phenomenon. Advertise your special areas, because someone out there, miles away, is interested and doesn’t know you exist. You’ll both benefit, customer and retailer. We’ll all be happier for it. They say that first impressions last. Just be aware that for an awful lot of us shoppers, that essential first impression is now being carried by broadband, and shops are being judged before we’ve even set foot in the door. So those are my biggest current gripes. There are more, there are so many more, such as unsuitable stock, too many cheap chinese imports, lack of facilities like toilets, but I think the above points are all pretty much deciders in whether or not I’ll buy at any premises.